As the temperature oscillates between extremes, the body is confused: to wrap the fingers around a hearty cup of soup or to sit outdoors under the shade and cool off with a mild salad? This winter definitely seems undecided. Being in Texas we seem to live on “borrowed” weather. If the snow storm sweeps the north east we are into the lower twenties, with the chilling winds knocking the knuckles out. No snow. No freeze. If the chinook blows in Colorado, the next day will be a gift with the sun shining down on us at a 65 F.
Hot chocolate or cold coffee? 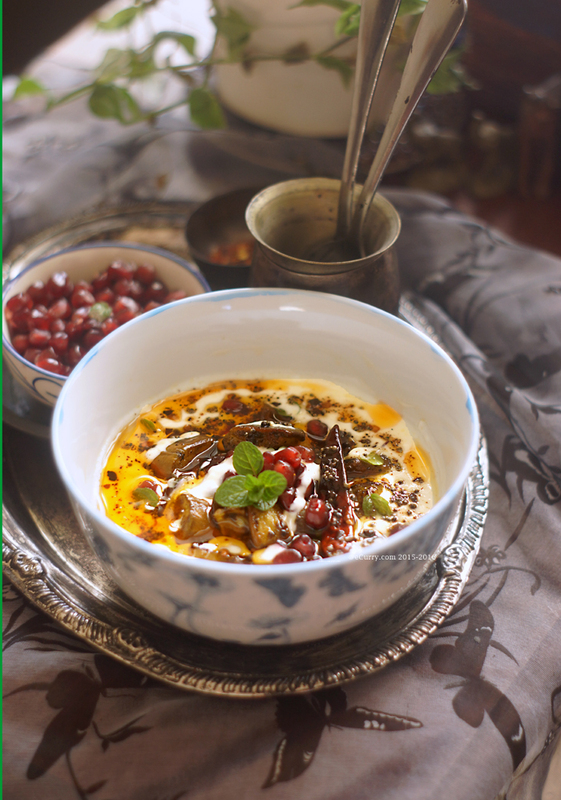 Spicy bowl of dal or a quick raita? Down jacket or a vest? Decisions to make. To keep up. Ah! the troubles of life. No not really troubles. For I am blessed with a life of peace. If I can shut my eyes and ears to the killing and crying happening in other corners of the world. There is not much that I want to see when the news is on. I shy away on purpose when scarred, bleeding faces of children flash on Google news. Ignorance is bliss. It is. 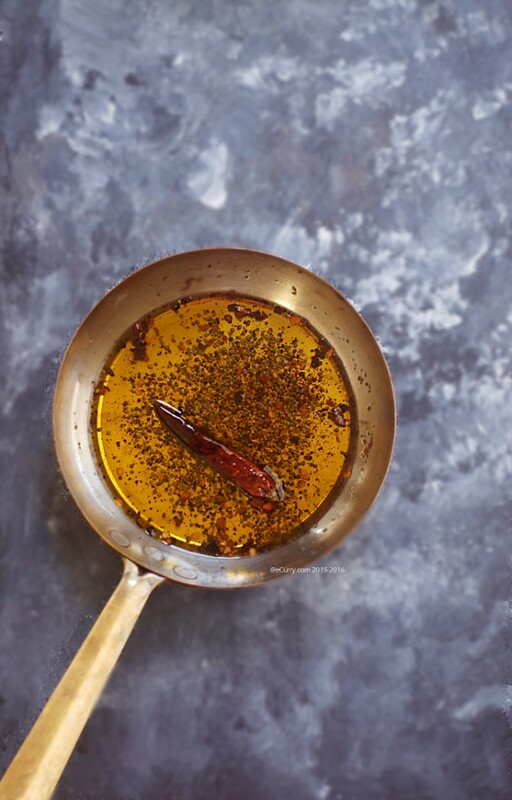 Oil tempered with spices to season the yogurt. Raita is a popular side dish or a salad or condiment (whatever way you want to see it). The base ingredient is yogurt, mildly seasoned. What you add to the yogurt is entirely up to you. Probably the most common is the cucumber raita. Little chunks of cooling cucumber with chilled yogurt and mint offers respite during the dry summer heat. Sometimes during summer months that is all you crave for. However there are fruit raitas and raitas made with with other vegetables which are raw or are slightly cooked. Like eggplants. 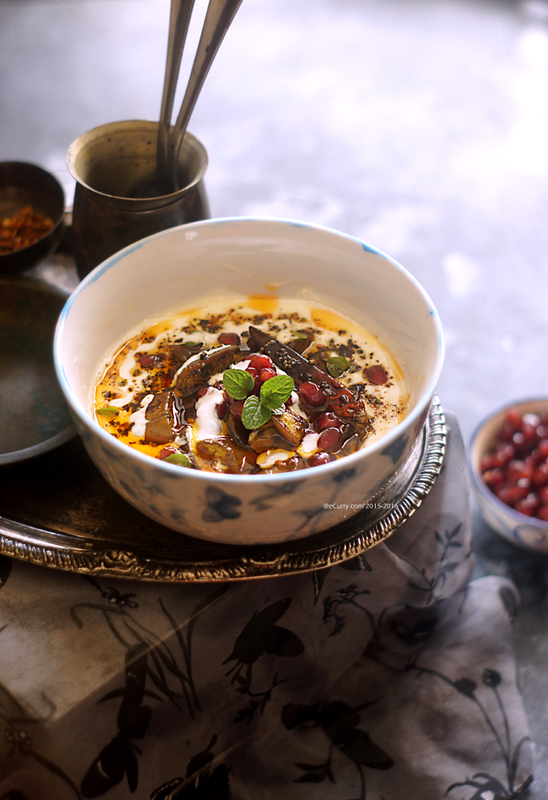 The spices used for seasoning the yogurt varies from one part of the country to another, depending on traditions, availability and popularity of spices. 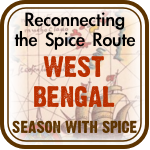 A sprinkle of roasted cumin is popular in the north. A tempering of mustard and curry leaves belong to the south. What I did today is my own. It works well. 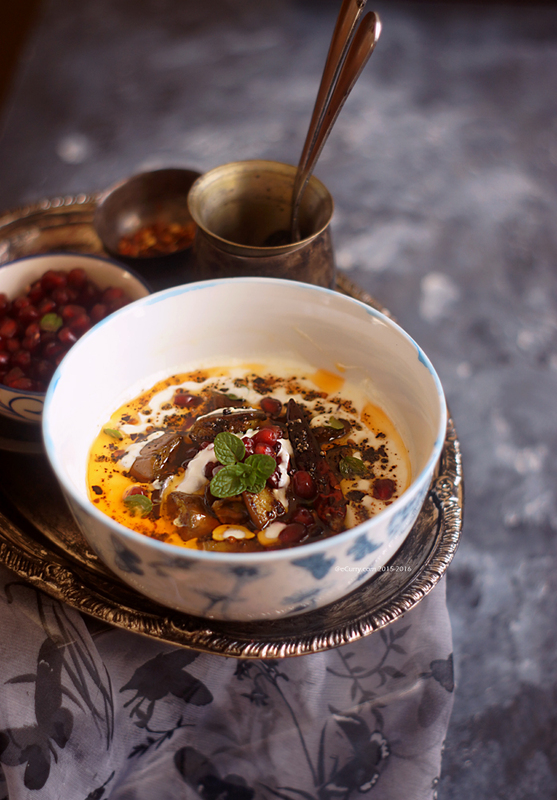 The slight pop of the mustard seeds, the smoky flavors of the red pepper, and the fenugreek. The mint adds the cool refreshing touch. Pomegranates? I would add to anything. 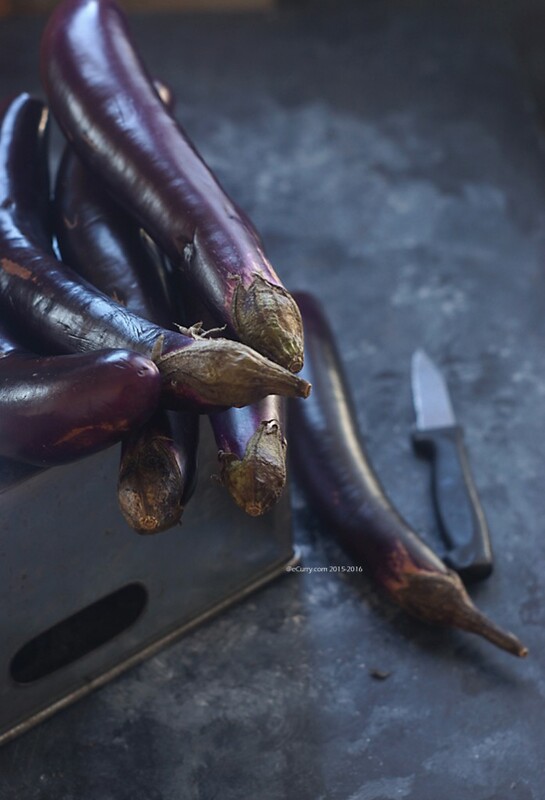 It is not a requirement in the Eggplant Raita. But it does add that irresistible crunch and sweetness. Do not give it a miss if you have the pomegranates! I only remind ourselves how fortunate we are: to be sheltered, surrounded by luxury. To have the choice of food and respond to the needs of our body as the temperature dips or rises outside. There are people out there who would be happy to have some water to quench their thirst. Forget the hunger or the blankets or the bed. Or the shade that sprawls over my backyard. Count my blessings. Every day. Every moment. The more I think, the meaninglessness of the sorrows becomes ever more prominent. So many tears, so much pain. Yes one can make a difference. We can try. But how much difference. No drop goes unheard. Yet it is not enough. Never enough. Yet it is not just now. It has been always. Over the ages of time. It just portrays in different forms. Recently I read “Uncle Tom’s Cabin” again. I sat shocked, stunned. Is it really possible? That human beings can degrade to that level? It had left me speechless when I had read it as a child. The time when I only knew love and trust. My grandmother had got the book for me to read from her school library. Sitting in another corner of the world, I had cried with a million questions in my mind. The dust has covered the stains. The heroes and the good and the evil forgotten. We have apparently leafed over a new chapter. There are choices in life to make. For those of us where choices are allowed. So one fine day when the dawn broke with a clear cloudless orange, I knew it was going to be good. A warm day in the midst of winter is always a gift. No one dare to throw it away. The little heads of mint showed up already in two days of warmth. Happy to be swaying under the warm rays. The sun streamed in the open windows. The leaves of the plants dancing to the breeze, inhaling the crisp freshness. Baingan or Eggplant Raita is what I chose. 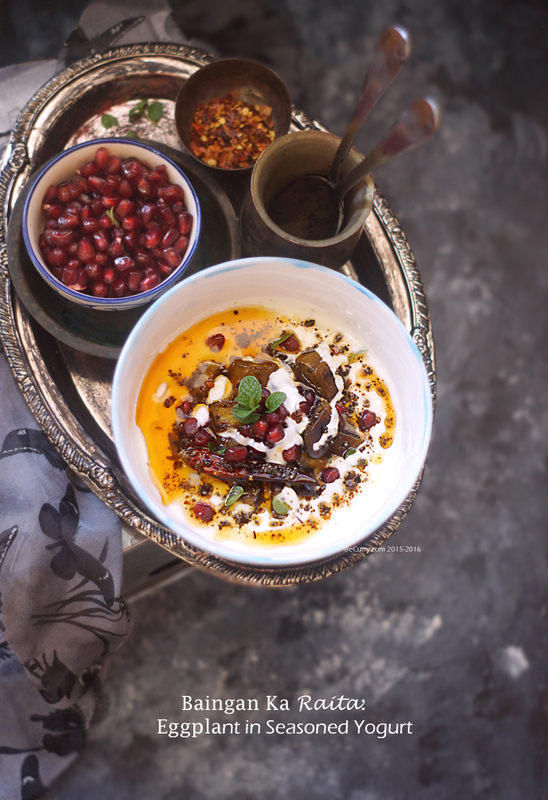 Cool yogurt combined with the earthy, meaty eggplants and the fresh hint of mint and pomegranate. Thick creamy wholesome yogurt coating the spoon. A slice of Naan on the side. All is good! Note: you may adjust the amount of yogurt to eggplant. There could be just enough yogurt to coat the eggplants or there may be more. Cube the eggplants and sprinkle salt and turmeric on them. Toss and allow them to sit for about 15 minutes. 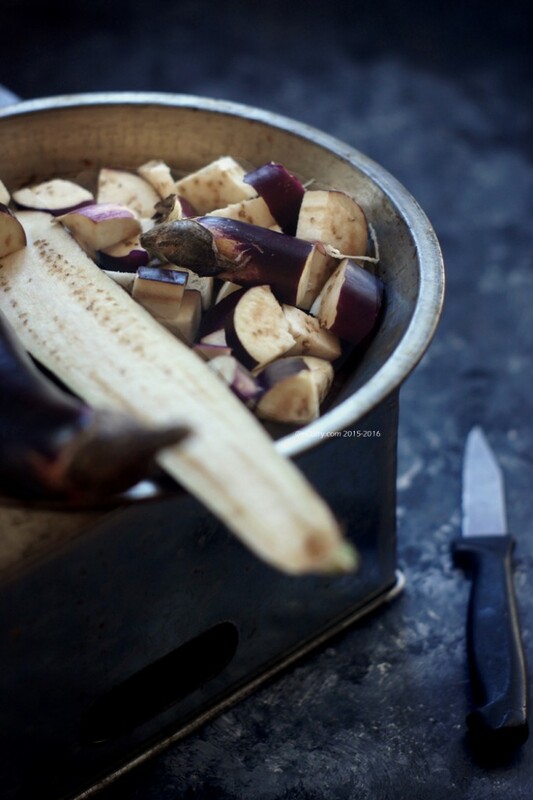 Heat enough oil in a pan to shallow fry the eggplants. 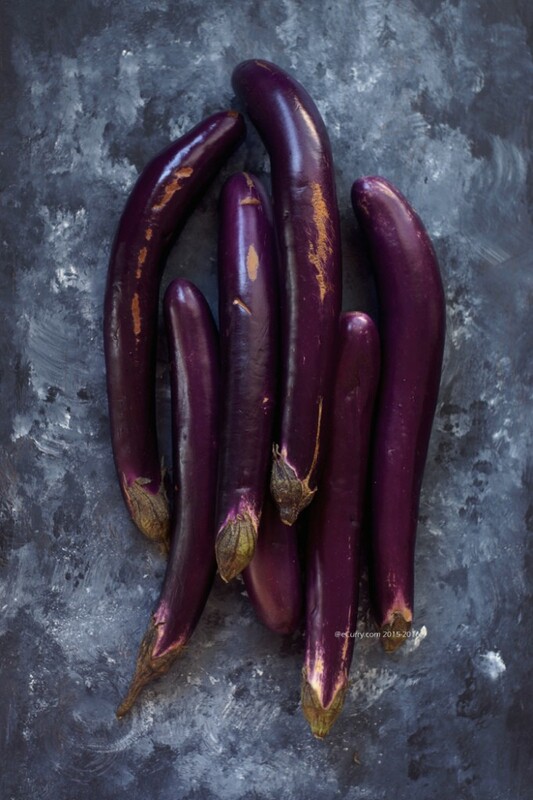 When the oil shimmers, add the eggplants and cook them while frequently tossing them until they are brown on all sides and cooked to tender. They will still hold their shapes and will not mush. Remove from pan and set aside and allow them to cool. Whisk the yogurt with sugar or honey, salt (to taste) and finely chopped fresh mint (or crumbled dried mint) until smooth and creamy. Gently fold in the fried eggplants into the yogurt. Next fold in the pomegranates and the sliced chili peppers if you are using them. 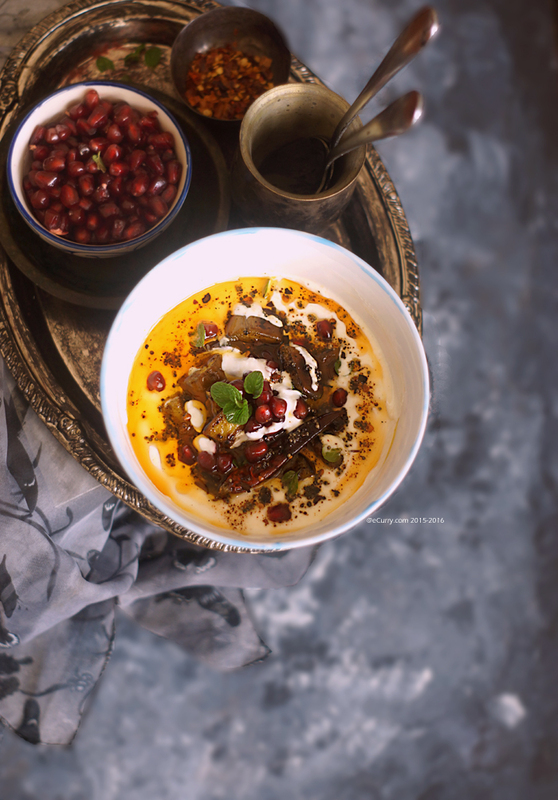 You may save some of the pomegranate arils for garnish. Now you will temper the raita to flavor it with spices: Heat 1.5 teaspoon oil in a small small. 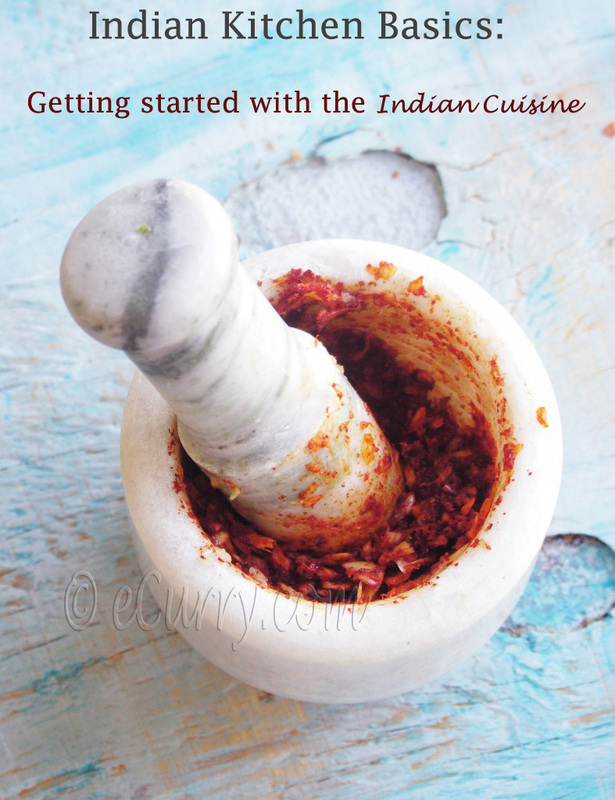 Add the hing/asafoetida (if using), mustard and fenugreek seeds, whole red chili pepper and the crushed pepper. When the seeds starts to pop and the pepper turns brown, switch off the heat and remove from heat. Add the red chili powder or parprika or cayenne to the hot oil. This will add color to the oil. Immediately pour the hot, spiced oil over the yogurt and gently stir in. You may garnish with more fresh mint. Serve warm or chilled. 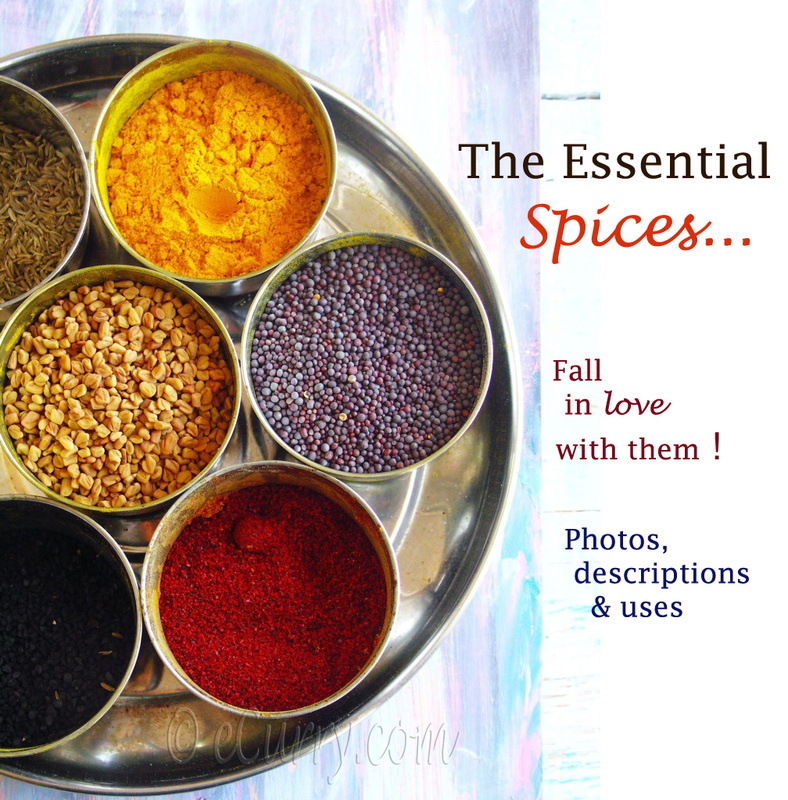 This is a side dish and pairs very well with any Indian meal or just with warm buttered Naan. 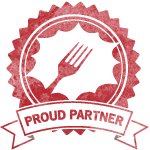 February 9th, 2015 | Category: Condiments, Dips & Sauces, Sides & etc. 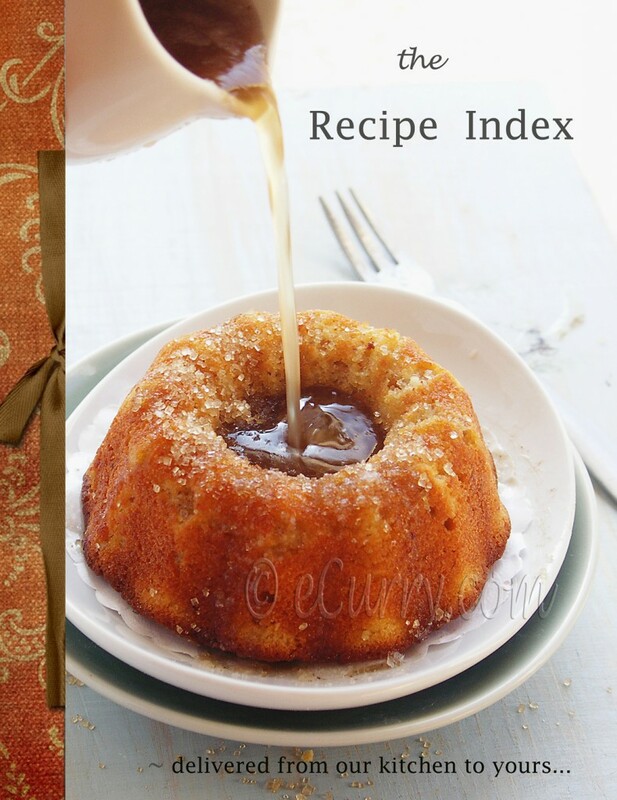 I love your blog and your delicious looking recipes. Though the things happening in the world are hard to watch I do not think that turning a blind eye and sleeping soundly is the answer you should be encouraging. Yes we are blessed and we should try to do things, no matter how small to try and help and impact those that cannot go to sleep without the sounds of war in their ears. Oh I am not encouraging ingnorance at all! I just write random thoughts. I curl up when it hurts and move away… for moments. But that does not mean I enjoy the good things in life while I let the world turn. I do my part, as self, with my family, with my children and as a community. The hurting and the crying too. I am not without compassion 🙂 I am sure I can do more. Every drop counts. Every little voice of awareness has impact. There is too much going on…. too sad. I am sorry one of my depressing moments came across as not postitive. It is just that this place is like my daily diary! What an aromatic and flavoursome dish. This is perfect for me to make for myself & vegetarian family. Thanks! I hear you, we live in a terribly twisted world. And sometimes, we really want to protect ourselves from the hurt. Just the other day, I heard something ” half the world worries about reducing the tummy, while the other half worries about how to fill it”. Made me feel so small. So true… the quote. And can we really protect ourselves from the hurt? Or do we want to? I do not think so. For one can do something for the other side only when the hurt and the pain is there. It is just that I do not like going through the gory details of the facts…. I do not need to know how much… I rather spend that time doing something for it. These days all news is just the gory details of the pain and the world going crazy! A lot of people have lost their mind. A handful of the world is giving their life to save it! This dish is just gorgeous! 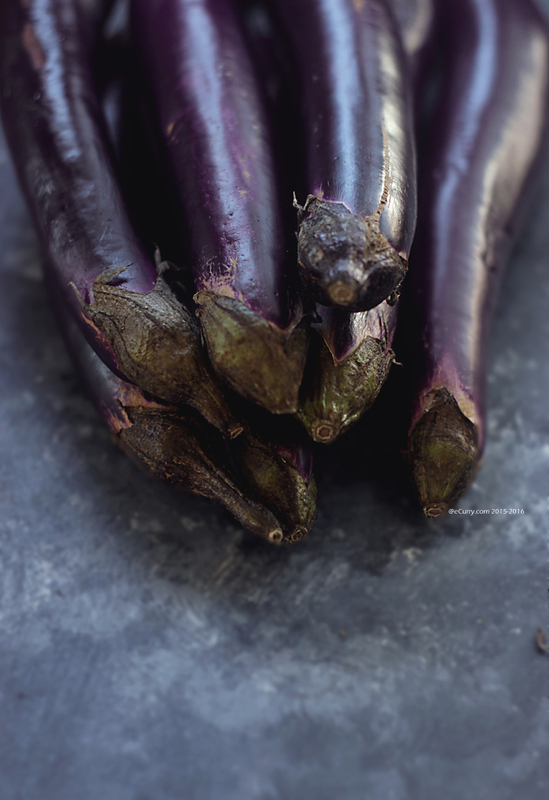 Eggplant may be my favorite vegetable, especially those long and tender Chinese variety. Pinning this to make for dinner soon! I know my whole family will love it! A very innovative raita dish. 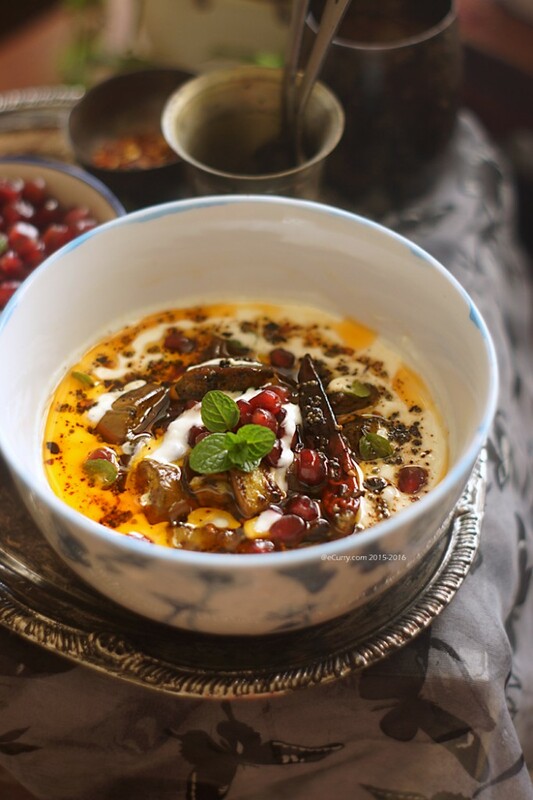 I am aware of apple raita, Dahi raita but not Brinjal Raita…However, looks really awesome. Thank u for the share. Keep posting with lots more.